Note: This paper is an extension of the paper titled, "Indian Ruby - Deposits & Characterisation" authored by Shyamala Fernandes, Vikas Joshi, Dr. Dietmar Schwarz and Ritu Bharadwaj, presented at the International Gemmological Conference (IGC), held in Goa in 1999. While, the current study was presented at the International Gemmological Conference (IGC) held in Vietnam in October 2013. In this paper, the emphasis has been given on the inclusions rather than the characterisation of the material. India is known to produce exquisite blue sapphires from Kashmir, along with some extraordinary sizes of star rubies from Mysore in the Karnataka state and facet-grade rubies and pink sapphires from Karur district of Tamil Nadu (e.g. Fernandes et al., 1999 and Durlabhji et al., 2003). Ruby deposits in India are mainly associated with gneisses and schists, with variations in mineralogical composition and grade of metamorphism (see e.g. Sarkar & Guru, 2005). The basic rock types have been given in table 1. 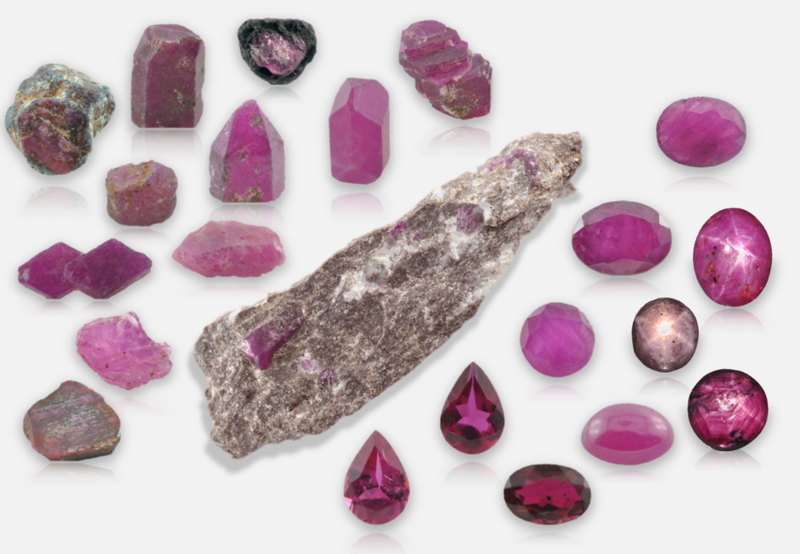 In this paper, an attempt has been made to correlate the types of inclusions observed in rubies from various Indian states and their associated rock types. One face of 25 rough samples out of 55 were polished for the purpose of inclusion study. These were collected directly from the miners. Airix Corporation / TechnoS Instruments' STR 300 confocal microspectrometer with solid state 532 nm laser excitation; exposure time - 10 seconds per scan, and 10 scans per target. Shimadzu IR Prestige 21 FTIR with diffused reflectance accessory at resolution of 4 cm-1 and 50 scans per sample. The common inclusions observed in Indian rubies are illustrated as follows and their association with the rock types are summarised in Table 1. Fingerprints: In the form of veils, however, their visibility is not very pronounced, due to the presence of large number of twinning planes. This study revealed a wide range of inclusions found in Indian rubies, which were of more or less similar type, pattern and appearance. No consistency was observed in the type and pattern of inclusion, restricted to a specific locality (states) and the associated rock types, although some of the mineral inclusions were identified only in specific locality such as hematite and anatase (in Chhattisgarh), black spinel (in Orissa), pyrrohtite and nepheline (in Karnataka) and monazite (in Tamil Nadu). Choudhary, G., 2012. An overview of inclusions in Indian gemstones. 3rd International Gem & Jewelry Conference (GIT 2012),Bangkok, proceeding volume, pp 149- 152. Durlabhji, M., Fernandes, S., Choudhary, G., 2003. ICA Mining Report. Fernandes, S., Joshi, V., Schwarz, D. & Bharadwaj, R., 1999. Indian Ruby - Deposits & Characterization. XXVI International Gemmological Conference, Goa, India. Fernandes, S. & Choudhary, G., 2010. Understanding Rough Gemstones. Indian Institute of Jewellery, Mumbai. Indian Bureau of Mines 2010. Indian Minerals Year Book 2011, 50th ed. Indian Bureau of Mines, Nagpur, India (http://ibm.nic.in/IMYB%202011_Corundum%20&%20Sapphire.pdf; accessed 03-05-2013). Panjikar, J., 1997. Comparative study of corundum from various Indian occurrences - Corundum from Orissa. Indian Gemmologist, 7(1-2), 12 – 17. Panjikar, J., 1999. Comparative study of corundum from various Indian occurrences - Corundum from Karnataka. Indian Gemmologist, 8(1-2), 3-8. Panjikar, J., 2002. Comparative study of corundum from various Indian occurrences - Corundum from Tamil Nadu. Indian Gemmologist, 10(1-2), 3-8. Sarkar, S.K. & Guru, A.I., 2005. Review of gemstone belts of eastern and southern India and guidelines for the search of gemstone deposits. Indian Gemmologist, 13(1-2), 41-49.